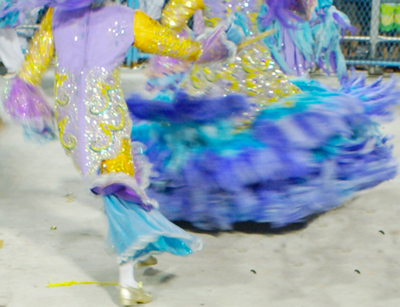 Ever thought of parading with a top Samba School? Dressed up in a gorgeous costume? And feel the heart of the beat in the very middle of the avenue, surrounded by other beautiful people? So let your dream come true! CarnivalService.com offers you the unique opportunity of parading with a top School (belonging to the special group or group A) dressed up in a genuine costume! We have partnership with Schools which allow non-members to wear their exclusive costumes and parade with them. Samba Schools are split into several "wings" (alas, in Portuguese) when they parade along the avenue. In each wing School members wear specific costumes, all of them designed in accordance with the School theme of the year. 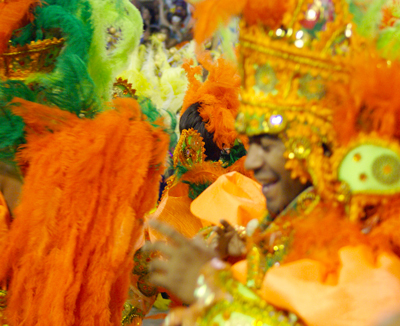 Costumes are a vital item in the competition among Schools during the Carnival parades. For this reason, you should honor your host School by not wearing your costume prior to its parade and by keeping the garment in perfect condition. You should also keep in mind that you must never wear the costume of a host School at another School's parade. However, after the parade of your host School you may wear the costume at balls or at the street Carnival. To make the most of your costume, wear it at the right place at the right time. Take note of the date and time of the parade of the host School from which you are buying your costume. You'll be requested to be at the Sambadrome at least two hours in advance. This is when Schools gather to warm-up (concentração) and do their final rehearsal. You can buy your costume through our site and pay for it with PayPal or VISA. To view the selection available for sale, visit our section Rio Carnival Costumes, under the SHOPPING heading of the main menu. As soon as the purchase process is concluded, we'll send you an e-mail requesting your measures (waist, collar, etc), preferably in CENTIMETERS. As soon as the Schools make their songs available (samba-enredo, in Portuguese) we'll also do so on the site, to help you practice in advance. Enclosed with your costume you'll find further information about the warm up time prior to the parade. You will have an unforgettable time: we guarantee! important information about ordering costumes! For the delivery of your costume in Rio, the same rules for tickets are applicable. Please check the section Rio Carnival Tickets, under the SHOPPING heading of the main menu for more details. If you want to know more about our purchase and delivery system, please check our GENERAL TERMS and/or our FAQ. 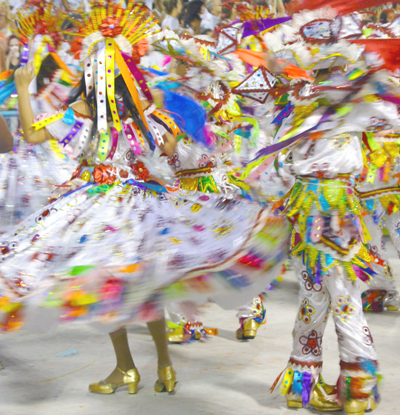 GET Your Rio Carnival Costumes NOW!